Poison ivy and poison oak are allergic skin rashes that affect millions of people across North America each year. 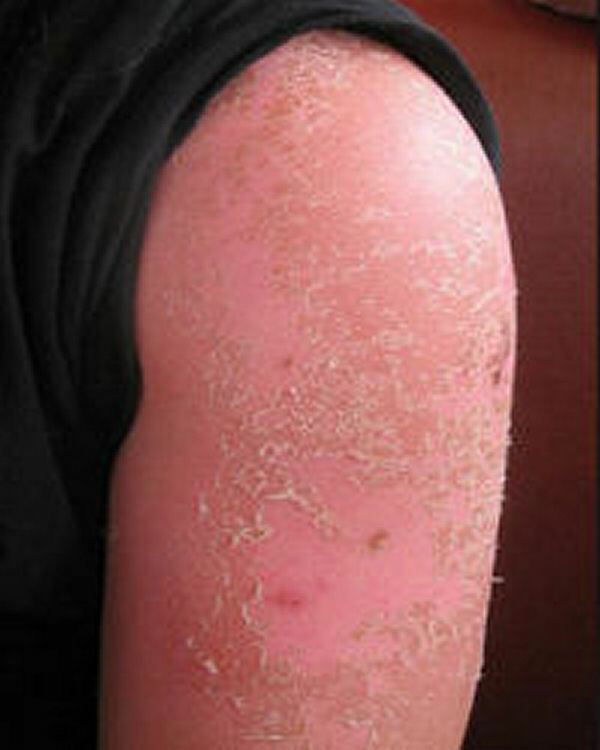 The rash begins as tiny red bumps on the skin and eventually progresses into large, itchy red blisters. The blisters eventually begin to crust and peel, and usually heal within 2 weeks on their own. 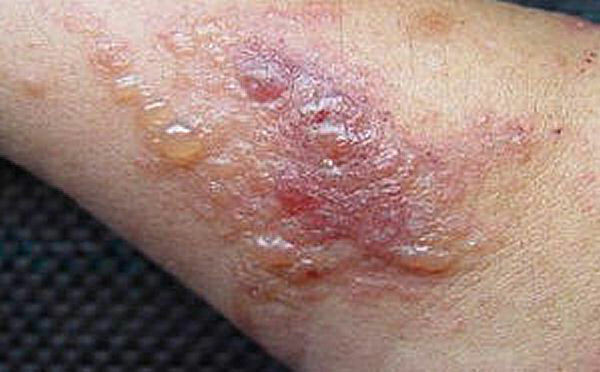 Although the rash can affect any part of the body, it most often irritates the face, hands, arms, legs, and genital area. The rash itself is not contagious. The level of sensitivity to poison ivy or oak can vary significantly from person to person. Roughly 15 percent of the population can have quite severe reactions, while another 15 percent have no reaction at all. Everyone else usually falls somewhere in between. 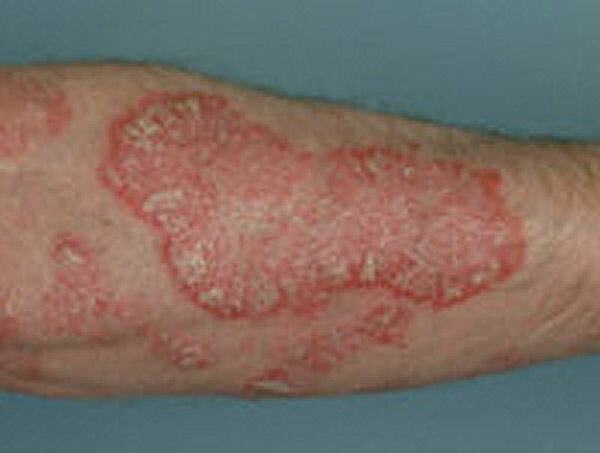 Poison ivy and poison oak occur when a person's skin makes contact with a colorless oil called urushiol. This oil is often found in the stems or leaves of the poison ivy or poison oak weeds, so it often causes a rash only when the plant is stepped on, sat on, crushed, or if it is generally disturbed in some way that causes the oil to be released. The skin rash usually begins to develop within 12 to 36 hours once contact is made with the oil. The amount of urushiol in the plant is usually highest in the spring and summer months, but cases of poison ivy and poison oak can also occur in the winter. Therefore, it is not surprising that people who suffer the most from poison ivy are usually outdoor enthusiasts such as campers, hikers, or gardeners. Obviously, the best way to deal with poison ivy or oak is to simply avoid making contact with the plants! The best way to do this is by first being able to recognize the plants. 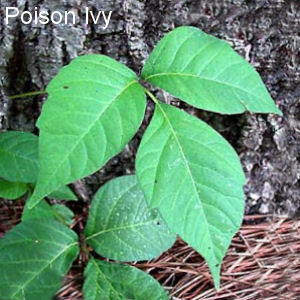 Poison Ivy: These plants have pointed, serrated leaves that usually appear in groups of three. In the summer, the leaves are green but they become red in the spring and fall seasons. The plant grows as a vine and has gray-white berries. 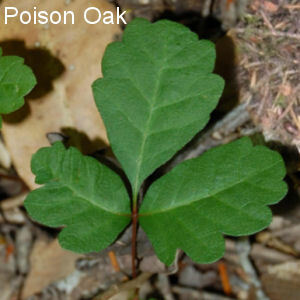 Poison Oak: This plant also has leaves that appear in groups of three, and the plant grows as a shrub or small tree with greenish-white berries. wear long pants and long-sleeved shirts if you're sensitive or if you know you will be in an area with poison ivy. water diminishes the effects of the oil, so always wash or rinse any items that may have made contact with the plants. This includes clothing, shoes/boots, camping or fishing gear, etc. the oil from poison ivy or oak can cling to a pet's fur, so put on some gloves and rinse your pet if you suspect they've been around poison ivy. A simple rinse using vinegar is a great way to soothe the itchiness of a rash. Start by washing the area with soap and water, and then apply the vinegar by rubbing it gently onto the rash using a cotton ball. Aloe vera contains some effective anti-inflammatory ingredients that make it a wonderful natural remedy to soothe the itchiness of poison ivy. You can break off a leaf from a fresh aloe plant and apply the fresh juice onto the affected area. Allow the juice to dry, and then wash the area with water. Continue this process every 3 hours. Witch Hazel has been found to contain a number of anti-inflammatory, anti-bacterial, and astringent properties, which may be helpful when treating poison ivy or oak. Mix a small amount of witch hazel with an equal amount of water, and apply a generous amount of the mixture directly onto the affected area. This can be repeated 3 times per day. Calamine lotion has been used as a soothing agent for poison ivy and poison oak for many years. This is largely because it contains zinc oxide, which is a drying agent that helps prevent the rash from blistering and oozing. It also contains phenol which is an anti-itching agent, and it also has mild antiseptic effects that help prevent infections. It is a good idea to only apply a thin layer of calamine lotion to prevent it from sealing the pores of your skin. A soothing paste can be created by mixing baking soda and water. You can then spread this paste onto the affected area to relieve itching. Leave the paste on for 2 hours, and then rinse the area with water. Apply this paste 3 times per day. Another great way to ease poison ivy itch is by applying ice cold compresses onto the rash for a few minutes. Use ice packs if available, or else place ice cubes into a plastic bag and then wrap the bag in a thin towel before applying. Discover how to treat this chronic skin disease with home remedies. Find a number of natural remedies to relieve the discomfort of sunburned skin.